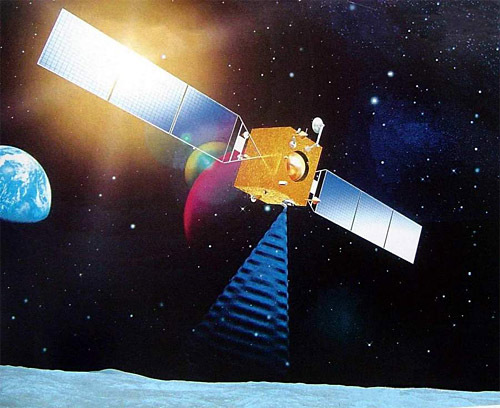 According to this item from the Xinhua news agency, the first Chinese lunar orbiter, Chang'e 1, was intentionally de-orbited and crashed into the Moon today, at 08:13 UTC March 1, 2009. They gave its impact location as 1.5 degrees south, 52.36 degrees east, which Phil Stooke says is within Mare Fecunditatis and 120 kilometers west of the landing site of the 1970 Russian sample return mission Luna 16. Thanks to Geert for the tip. That leaves three craft still orbiting the Moon: Chandrayaan-1, Kaguya, and one of the two Kaguya mini-satellites, Ouna, the other mini-satellite having crashed on February 12.